EU calls on Israel to respect its obligations towards terrorist prisoners, expresses concern about four detainees on a hunger strike. The European Union on Saturday called on Israel to respect its human rights obligations towards Palestinian Authority Arab terrorist prisoners, saying it was concerned about the condition of four detainees on a long-term hunger strike. The European Union is "following with concern" the worsening health conditions of Samer Assawi, Jaafar Ezzedine, Ayman Sharawneh and Tareq Qaadan, who are all staging long-term hunger strikes, the bloc's foreign policy chief Catherine Ashton said in a statement quoted by AFP. "The EU calls on the government of Israel to allow for the immediate restoration of their family visiting rights and calls for the full respect of international human rights obligations towards all Palestinian detainees and prisoners," she said. In the past, Ashton seemed to suggest in a statement that PA Arabs have the right to throw stones at security forces during non-violent protests. She also made a skewed comparison between the lethal, unprovoked shooting attack at a Jewish school in Toulouse and the unintended deaths of children in Gaza when Israel attempts to stop missile launchings and apprehend terrorists. She later categorically denied making that comparison. 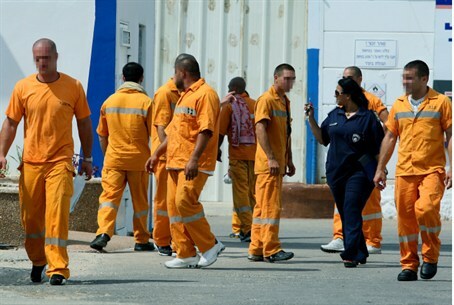 The PA’s prisoner affairs minister, Issa Qaraqe, said in a statement on Saturday that Israel was responsible for the prisoners' well-being. Qaraqe said that PA Chairman Mahmoud Abbas was holding intense talks with world leaders to prevent a possible "disaster," as he put it. "The Palestinian people will not stand by in face of what is happening in the prisons," Qaraqe warned, according to AFP. PA Arab terrorist prisoners have turned hunger striking into a pressure tactic aimed at forcing Israel to release them out of fear for their lives. Israel has several times in the past caved to the pressure and released some hunger strikers. On Tuesday, PA Chairman Mahmoud Abbas called on the international community to intervene urgently in support of the hunger striking prisoners, warning that “things may get out of control” if it does not intervene. On Wednesday, a United Nations official expressed concern about the well-being of terrorist detainees in Israeli prisons and in particular about the condition of hunger striker Samer Issawi. On Friday dozens of people were wounded as PA Arabs around Judea and Samaria staged solidarity events for the hunger striking terrorist prisoners, challenging IDF troops who came to disperse the riots. Two IDF soldiers were lightly wounded from the rocks thrown by the Arabs near the Ofer Prison.